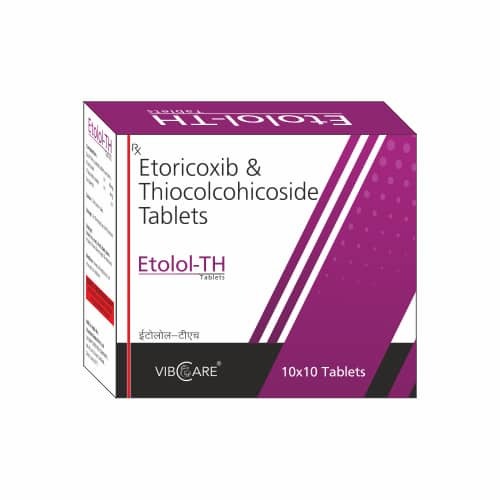 Etoricoxib is a new COX-2 selective inhibitor. Current therapeutic indications are: treatment of rheumatoid arthritis, osteoarthritis, ankylosing spondylitis, chronic low back pain, acute pain and gout. Like any other COX-2 selective inhibitor, Etoricoxib selectively inhibits isoform 2 of cyclo-oxigenase enzyme (COX-2). This reduces the generation of prostaglandins (PGs) from arachidonic acid. Thiocolchicoside is a muscle relaxant with anti-inflammatory and analgesic effects. It acts as a competitive GABAA receptor antagonist and also glycine receptor antagonist with similar potency and nicotinic acetylcholine receptors to a much lesser extent. It has powerful convulsant activity and should not be used in seizure-prone individuals. Has been shown to cause chromosomal aneuploidy and male infertility. Should be avoided during all stages of pregnancy, lactation and puberty. Is a potential risk factor for cancer. For the treatment of rheumatoid arthritis, osteoarthritis, ankylosing spondylitis, chronic low back pain, acute pain and gout. For the treatment of muscle spasms.